Title: 09/20/1988 - Crystalline silica considered a carcinogen under the HCS. This is in further response to your letter of May 23 which petitioned the Occupational Safety and Health Administration (OSHA) to clarify or amend the Hazard Communication Standard (HCS) with regard to its applicability to crystalline silica. The petition, filed on behalf of the National Stone Association, requested that OSHA indicate that crystalline silica is not considered to be a carcinogen for purposes of communicating hazard information to employees under the HCS. For the reasons discussed below, the petition is hereby denied. Information regarding the evidence of carcinogenicity must be included on required labels and material safety data sheets for crystalline silica, and for products containing crystalline silica, where employee exposure to the crystalline silica may occur. The HCS is designed to provide information to employees about the hazards of the chemicals they may be exposed to while working. The definitions of the hazards covered under the rule are intentionally broad to ensure that employees and downstream employers receive all relevant information about the chemical involved. OSHA has determined that lack of information regarding a chemical's hazards and appropriate protective measures constitutes a significant risk to exposed workers. The HCS is designed to address that risk by providing such information. To accomplish that purpose, the rule requires chemical manufacturers and importers to evaluate the hazards of the chemicals they produce or import, and to transmit the information they find or develop to employees and downstream employers. All employers are then required to train their workers and make the available information accessible to them. Unlike OSHA's substance-specific standards, the rule does not establish permissible exposures for the chemicals involved, nor does it require implementation of specific control measures other than the transmittal of information. It is expected that provision of such information will nevertheless result in reduced exposures because employers will have better information to use when designing protective programs for their exposed employees. And those employees will be better able to take steps to protect themselves. In order to ensure that all employees receive adequate information, it was necessary to establish a threshold for determining when a chemical is to be considered hazardous. For health hazards, if there is one study, conducted according to established scientific principles, which reports statistically significant evidence that the chemical poses the potential to cause an adverse health effect, the results of that study must be reported. (HCS, paragraph (d)(2)). This is an appropriate threshold for an information transmittal standard, which is intended to ensure that affected employees, as well as downstream employers, are aware of all existing scientific information regarding a chemical. In addition to the one study criterion, participants in the rulemaking supported the need for further thresholds for chemicals that are considered to be hazardous by well-recognized scientific or regulatory organizations. The rulemaking record supports OSHA's conclusion that knowledge of these organizations' findings on a chemical is an important piece of information for affected employees and employers, separate and apart from an individual evaluation by a chemical manufacturer or importer of what they believe the scientific studies indicate a chemical's hazards are. See, e.g., 48 FR 53298-99, November 25, 1983. Therefore, if OSHA has regulated a substance, the American Conference of Governmental Industrial Hygienists (ACGIH) has recommended a Threshold Limit Value (TLV) for it, or the National Toxicology Program (NTP) or the International Agency for Research on Cancer (IARC) have found the substance to be a potential or confirmed carcinogen, the substance must be considered hazardous and information provided as required. All of these organizations require substantial evidence before making a finding that a chemical presents a hazard, and it is important for users of such chemicals to be aware of what those findings are. To address the concerns of those chemical manufacturers or importers that disagree with the findings of these organizations. the HCS specifically permits them to present negative data as well. (HCS, Appendix B.) They are also allowed to include on a MSDS their own evaluations of the chemical, as long as they do not state anything that is inaccurate or scientifically indefensible. Contrary to the assertions in your letter, this is not a delegation of rulemaking authority to IARC or any of the other organizations involved. It is an assurance that all available information is provided, an approach that is necessary to provide employees with the right to know about the chemicals they are exposed to while working. The fact that IARC classifies a substance as a potential carcinogen is important information that is already public, and needs to be included with the hazard information provided to downstream employers and employees. The standard permits you to report whatever other negative information you believe is appropriate. Therefore, concerns of exposed employees, as well as the concerns of the producers of the chemicals, have been addressed in the regulatory design. Generally speaking, IARC's determinations involve a review of scientific studies that are already available in the literature on a particular chemical. The existence of one such study is sufficient evidence for coverage under the HCS. Of course, crystalline silica poses various respiratory effects that must already be included on labels and material safety data sheets. In your letter, you indicate that companies have "generally advised their workers and customers that exposures to mineral dusts which contain silica may cause silicosis." 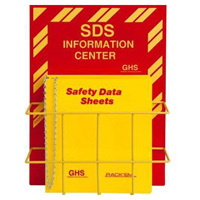 This information is certainly required under the HCS for employers covered under OSHA's rules. If you work with respirable silica, consider a supplied air respirator system like this one from Safety Emporium. But in addition to the longstanding evidence of the respiratory effects caused by exposure to crystalline silica, there has also been evidence in the published scientific literature that there are potential carcinogenic effects. This evidence should already have been included in information regarding crystalline silica prepared under the HCS. Whether IARC had published a monograph on the subject or not, the pre-existing scientific information must be reported to be in compliance with the rule. The existence of an IARC evaluation of the data is simply an additional piece of important health information. The requirement that IARC's evaluations be included in an employer's hazard determination process has been a provision of the standard since it was finalized in November of 1983. Challenges to that provision would have had to be filed within sixty days. The only challenge to the hazard determination provisions that was filed involved inclusion of more substances on the floor listing. The reviewing court found that OSHA's approach was appropriate. United Steelworkers of America v. Auchter, 763 F.2d 728, 739 (3d Cir. 1985). Therefore, it is certainly not true that the public has not had advance notice of the Agency's approach to hazard determination. The HCS is a generic rule, covering as many as 575,000 hazardous chemical products, and the hazard determination process is not an approach that is to be reconsidered for each individual substance. The rule clearly indicates that the latest editions of IARC and NTP are to be used. One of the primary advantages of a generic approach is the dynamic nature of the rule, requiring chemical producers and importers to continually update the chemical hazard information provided to downstream employers and to employees as information becomes available. Certainly the rule cannot reason ably be interpreted to be limited to information available as of 1983. This clearly was not the intent, and would not protect workers to the extent feasible as required under the Occupational Safety and Health Act. As described in the IARC monograph on silica, there are at least five animal studies in the published scientific literature which resulted in "significant increases in the incidence of adeno carcinomas and squamous cell carcinomas of the lung" in the animals exposed to crystalline silica. In addition, there are a number of epidemiological studies which show an increased incidence of lung cancer in workers exposed to silica. As the HCS requires only one study to be considered sufficient evidence of carcinogenicity it is clear that in the case of crystalline silica. the evidence exceeds that threshold for determining the existence of a hazard. In addition. due to the weight of the evidence, a label warning as well as inclusion on an MSDS is warranted. In addition to the scientific evidence which clearly indicates that information regarding potential carcinogenicity of crystal line silica must be made available under the HCS, the National Institute for occupational Safety and Health (NIOSH) recently recommended to OSHA in another context that the substance be designated a carcinogen. In testimony presented at informal public hearings on OSHA's proposed rule on permissible exposures to air contaminants (August 1, 1988), NIOSH specifically stated that the final rule should designate that crystalline silica is a potential occupational carcinogen. In the recent notice of proposed rulemaking to modify the HCS, OSHA solicited comments on the newly adopted American National Standards Institute's (ANSI) voluntary consensus standard on precautionary labeling. 52 FR 29842 (August 8, 1988). Industry representatives involved in the development of that standard have indicated that it would be helpful if OSHA would consider labels developed in accordance with ANSI guidelines to be appropriate for compliance with the HCS. It is interesting to note that following the guidance of that industry standard, it appears to OSHA that silica would be labeled as a carcinogen. The HCS only applies when there is a potential for exposure. labeling requirements only apply when there is a container involved. As you have indicated that the industry in providing appropriate labels for silicosis, it appears that the companies have been able to determine when and where labels need to be provided. The addition of a cancer warning statement to these labels is required. We appreciate your interest in this important matter.